Streusel is a sweet, multi-use topping in pastry. 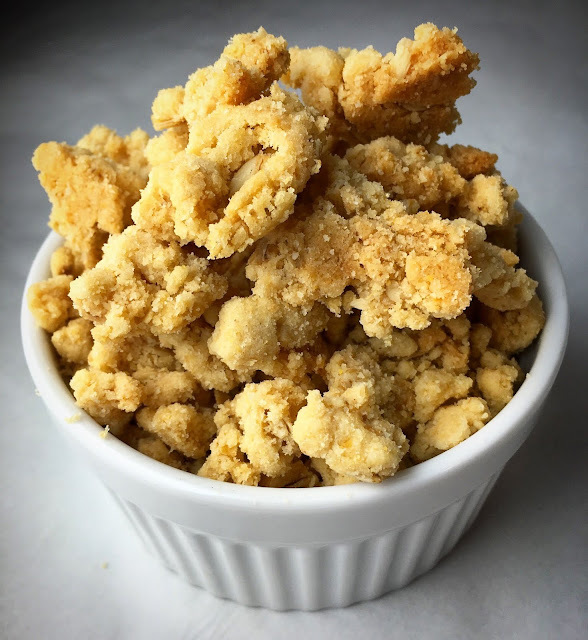 Typically made with just Flour, Butter and Sugar, it is not unlike a crumbled Shortbread Cookie. Streusel is quick and easy to make, and it can easily serve as a textural enhancement atop Breads, Pies and Cakes. The basic recipe, though already extremely versatile, can be customized in myriad ways. 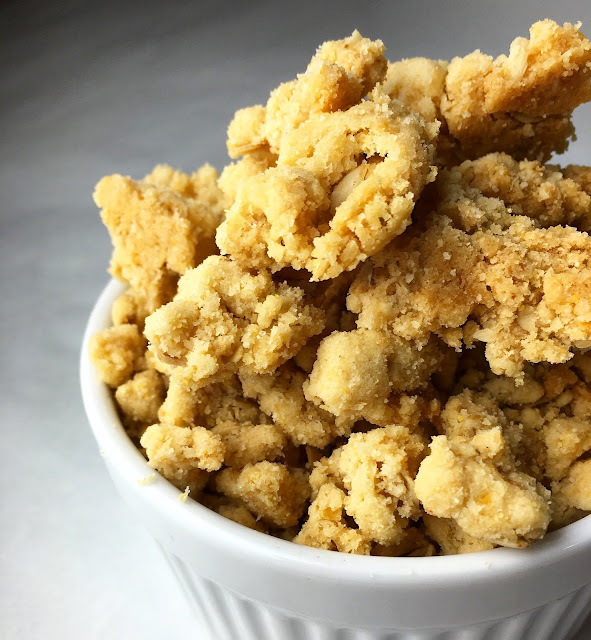 This recipe is an adaptation based on a Polenta Streusel that we used on occasion at Osteria Morini, Corn Meal being a key ingredient to highlight that menu's Italian influences. Corn Meal brings a unique crunch. And in this recipe, Oats and Lemon Zest add even more texture and flavor. But other common additions include minced Nuts, Extracts and various Spices. By keeping a few basic ratios in check, the possibilities are wide open. A Streusel can be baked on top of a pastry (or hidden between layers of Batter). It can also be baked in advance and used as a finishing garnish on plated desserts. There are no Eggs. There is no leavening. There is no complicated mixing technique. 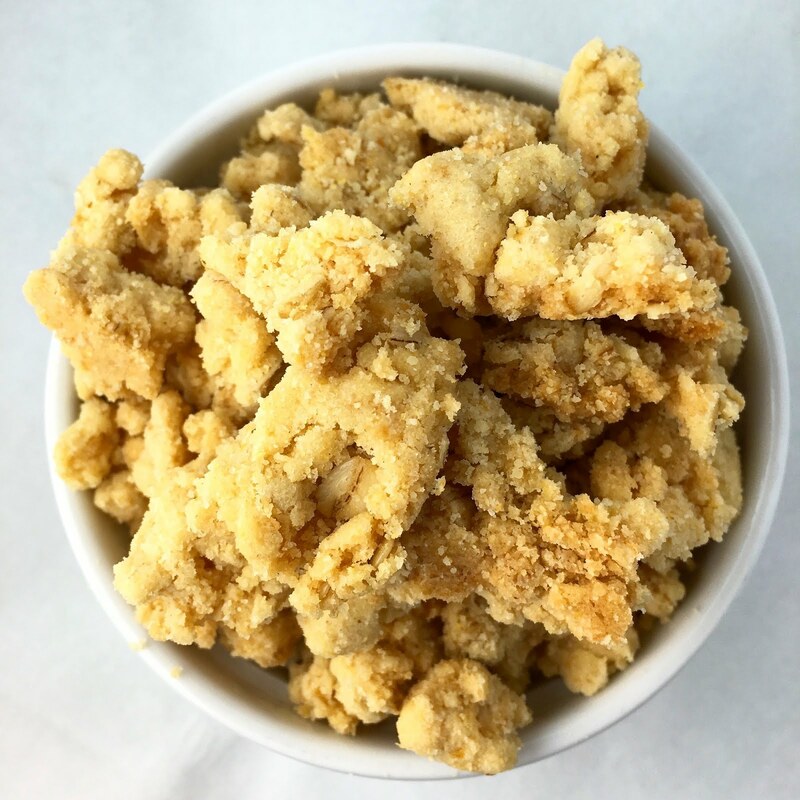 The ingredients are simply mixed together until they form a dry, crumbly Streusel Dough. Spices, Zests and Extracts can be added according to taste without affecting the balance of the Dough. If you want to add "Flour-like" ingredients such as Oats and minced Nuts, replace up to 50% of the Flour by weight (i.e. one part Flour). I do not recommend replacing more the 50% of the Flour - the resulting Streusel may be too crumbly. Some gluten-containing Flour helps hold the Streusel together. 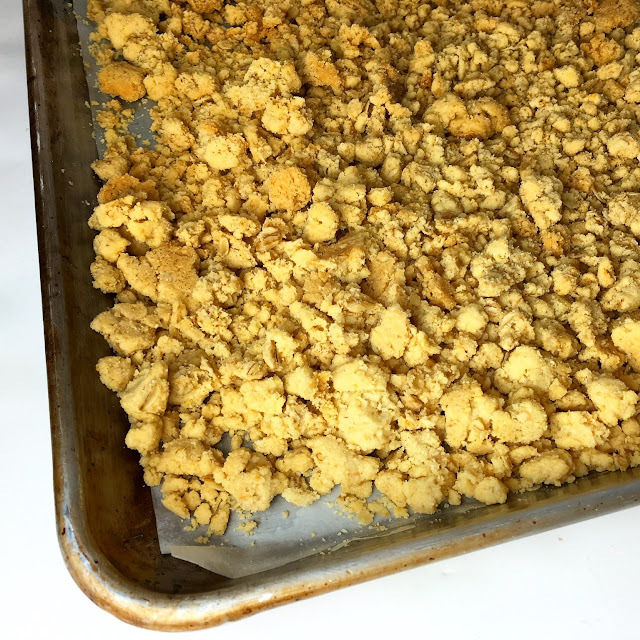 Bake the Streusel in a thin layer on a parchment or silpat lined sheet tray at 300 degrees Fahrenheit (149 degrees Celsius). Bake the Streusel for up to one hour, checking it every 15 minutes and breaking up any large pieces with a spatula. The Streusel is done when it begins to lightly brown and becomes dry and crumbly. Set the Streusel aside to cool. When the Streusel is fully cool, break up any remaining large pieces with your hands or briefly in a food processor. Because of the extremely low moisture content, the Streusel has a long shelf life. The Streusel will keep well in an airtight container at room temperature for several weeks. The Streusel can also be frozen for several months. 1. Preheat the oven to 300 degrees Fahrenheit (149 degrees Celsius). 2. Cream the Butter and Sugar in the bowl of an electric mixer fitted with a paddle attachment until smooth. Scrape down the bowl. Add the Vanilla Extract and Lemon Zest and mix until well incorporated. Chef's Note: It is not necessary to beat the Butter and Sugar until very light and airy in texture, as with many other recipes, as trapped air is not necessary to leaven the final product. 3. In a separate bowl, mix together the dry ingredients including the Flour, Corn Meal, Oats and Salt. 4. With the mixer on low speed, stir in the dry ingredients in thirds. Continue mixing until the Streusel Dough is just combined. 5. 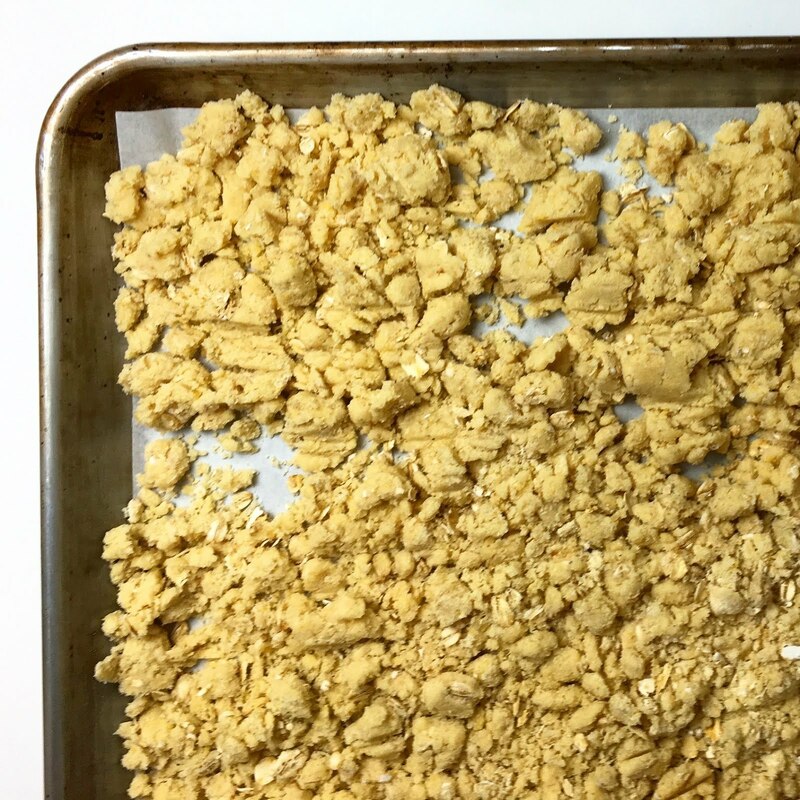 Using your hands, crumble the Streusel Dough in a thin layer onto a parchment or silpat lined sheet tray. 6. Bake the Streusel for up to one hour, checking it every 15 minutes and breaking up any large pieces with a spatula. The Streusel is done when it begins to lightly brown and becomes dry and crumbly. 7. Set the Streusel aside to cool. When it is fully cool, break up any remaining large pieces with your hands or in a food processor. Do not over-process the Streusel. - The Streusel will keep well in an airtight container at room temperature for several weeks. The Streusel can also be frozen for several months.